This Halloween, I watch others make their costume and wonder if I can throw together a costume of Agnes from Dispicable Me…or should I be the lady that runs the orphanage. My hair isn’t that short. And while she’s not evil…nope, best to stick with the 50’s house wife…Crap, I know just the old lady dress for that. Perhaps. Alas, I have Christmas gifts to make, and a recipe to finish. “Are you going to make that recipe tonight?” Dear James asks…almost innocently. Tomatoes, chopped, check-that’s easy. Onions, chopped, that’s easy. I should have all the ingredients. 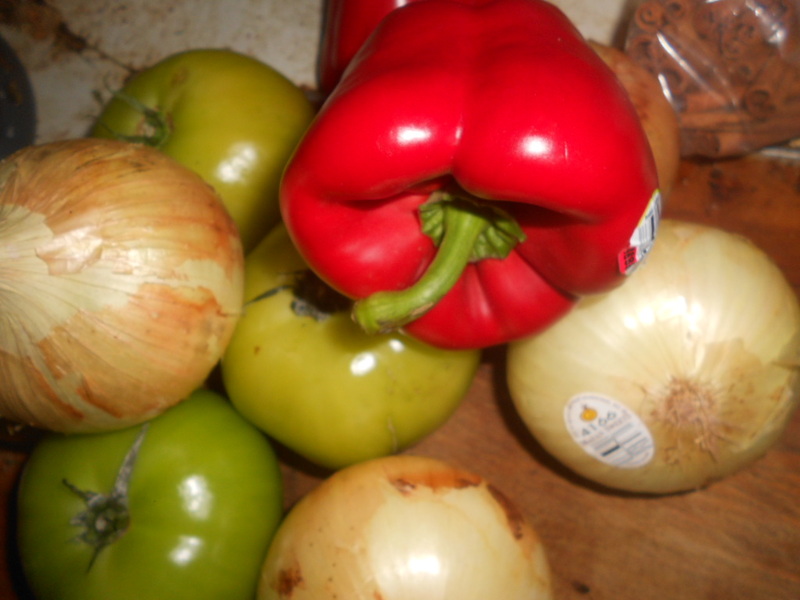 Then I read on to that ever so important Directions part: Layer the tomato, onions and kosher salt in a glass bowl, cover with plastic wrap and let sit overnight. …discussion ensues…I’m working my keister off tomorrow night, and leaving the canning to him…oh, my…I hope he doesn’t shoot me. If this blog stops, well, it could be due to a quilt retreat next week I need to pack for and prepare for, or it could be he decided to kill me after I made him can tomatoes. Remind me to remind him how much he likes these darned tomatoes. In the meantime, there was some knitting this week…close to two hours worth…I got the cuff cast on, and knit–which is my least favorite part. Though, I’m starting to see why it’s so often used. I also got the first cable repeat finished. I’d like to finish two, but I have a bedtime, as I actually have to work tomorrow. Sneak peak of the super-secret fantasy project. …and some days, I do feel as if I’m Livin’ On A Prayer. I admit it, I’m a big Bon Jovi fan. When I was much younger, the three top men in my life were Tom selleck, Patrick Swayze and Jon Bon Jovi. Each of them broke my heart by being/getting married. The big meanies. It still didn’t stop me from looking, just like I did tonight when I watched Monday’s episode of Dancing With The Stars. I enjoyed watching Derek channel Patrick, and well, the dancers in shorts were pretty hot too. I started watching for Paula Deen. As I grew, the loves of my life switched to men who could cook. As I watched the men in shorts, and channelling their inner Travolta, I enjoyed knitting the toe of the sock I’ve been working on. It’s been a banner week for eventfulness, and next week may also be eventful as well. Monday afternoon, we got up early and took Dear James to the doctor to get his throat biopsied…that was an experience. Yes, I stayed to watch. Perhaps I have a morbid curiosity, as well. I’ve never seen a biopsy before. I had a front row seat. Poor James had the hard work. I won’t go into the details. Putzer, claiming my knitting pattern book until he gets some love, too. Tuesday, I simply knit. I wasn’t feeling too great this past weekend, and decided a restful day was good. Wednesday, I went back to work for my short shift. I wish more of my shifts could be shorter. Then I came home, and I knit some more. But the exciting events occurred when decided to walk back to my own home(two and a half blocks away) for caramel sauce I could enjoy on an apple. I took both dogs with me at 3:30AM. We live in the city. It’s still dark, but I thought it was reasonably lit. 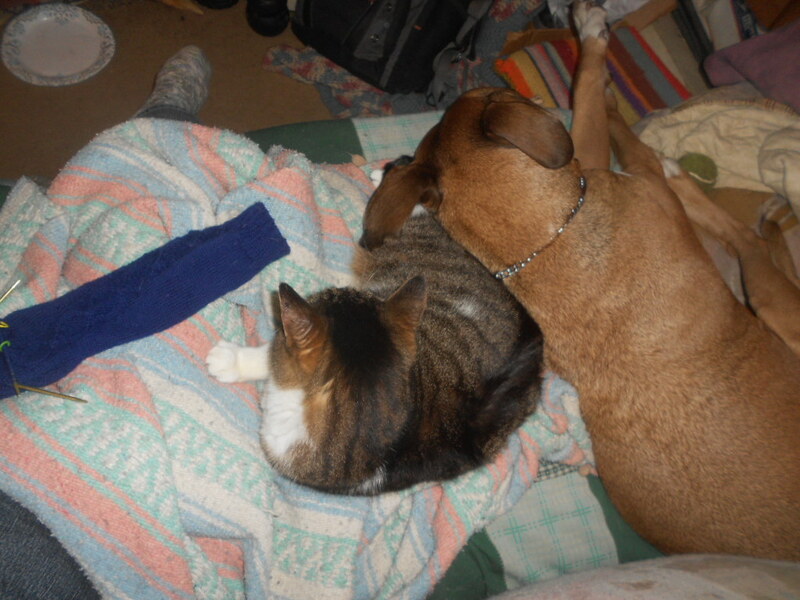 I decided to give them a slightly longer walk, as it’d been a couple of days since they’ve had a good walk. 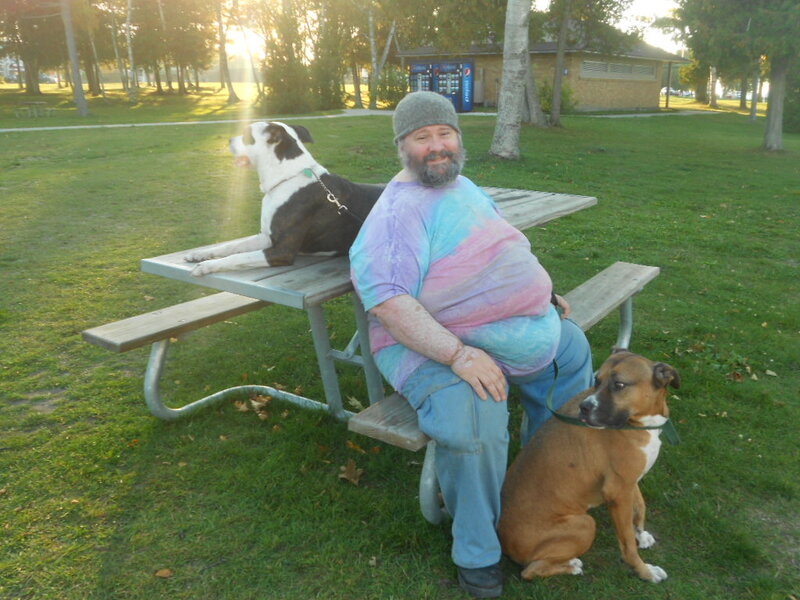 I walked them towards the library (only a half block from my house). I decided to walk them around the library and through the parking lot. That was, until I met the curb part of the sidewalk I forgot about and tried to chew up some of the darned sidewalk. The sidewalk won. It left some bruises on my cheek, the back of my right hand and my knees. It also took a chunk of tooth for being forced to act the accomplice for the curb’s mean and nasty prank. I began your Thursday morning in the dentist’s office, hoping I can get my tooth repaired affordably. (I do want to mention to the dentist that the tooth fairy is supposed to bring me money when I lose a tooth). An exam and an x-ray(that hurt) later, we decided it is affordable to repair. In addition, I remembered on my way there that I had Aflac accidental coverage. It does cover my tooth, so far. In the meantime, I’m sporting some Halloween tooth(sorry, I’m not sharing that photo–it won’t exist). Tonight, however, my dear James shared couch time with me, as my knees must hurt as much as his. 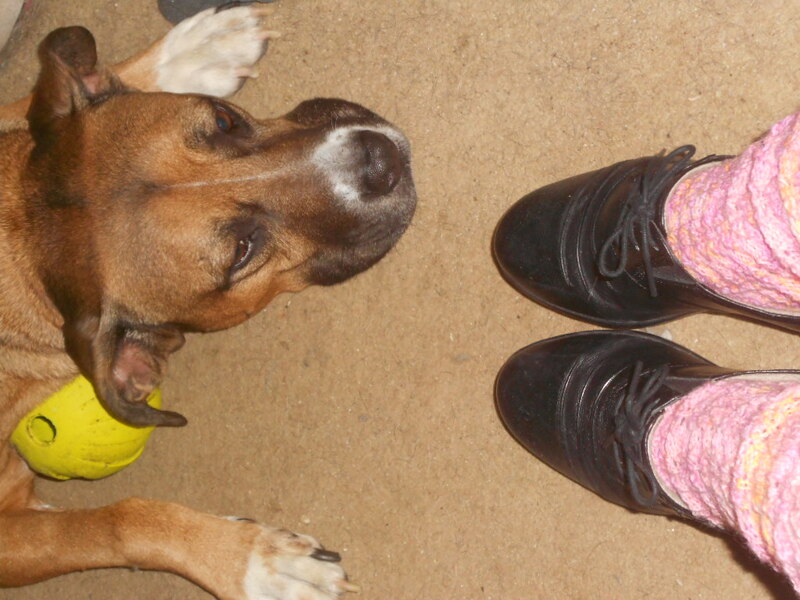 He can be so considerate, I feel guilty sometimes for picking on him, until he picks on me. 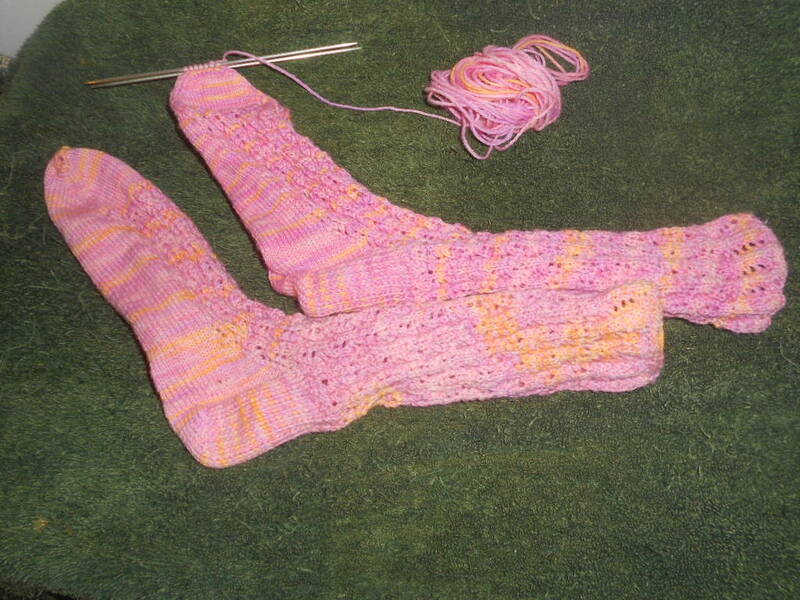 So, my tooth is half-way to repaired, but the real accomplishment this week is that the gift socks are half-way done. I got through the cables and to the toes. I stuck with the wedge toe. I swear, the next pair of socks I knit will have a star toe. It makes so much more sense to me. I like it better. 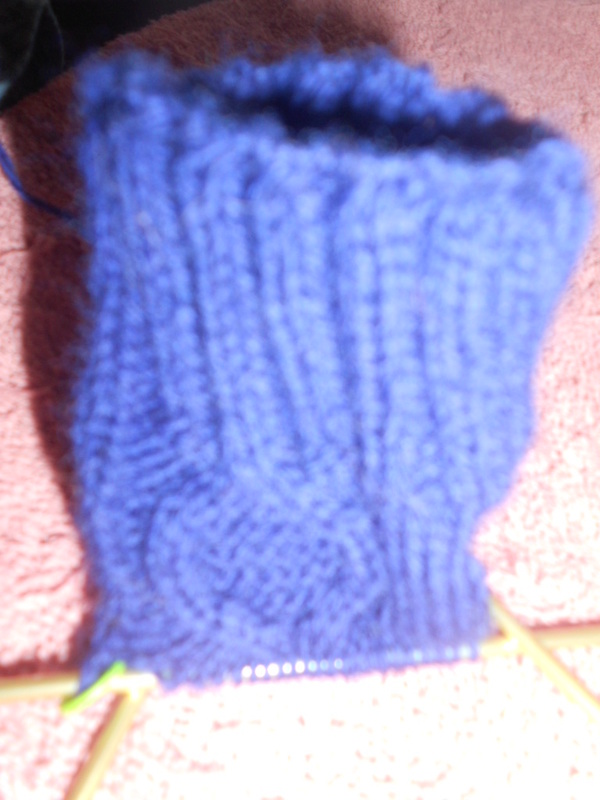 It requires a little more attention to detail, but after cables, star toes are quite easy. Though, with cables, the biggest problems I’ve had so far involve locating the cable needle when I needed it and reading the pattern correctly. The wedge toe, in its unappreciated glory. It seems I put in an extra length of cable repeat. These may become knee socks(or something rather close) for their intended recipient. The pattern read to repeat the cables two more times until the piece reached 7” from CO. Somewhere in there, I think it was the two more times, I got confused and have an extra section of cabling repeat. 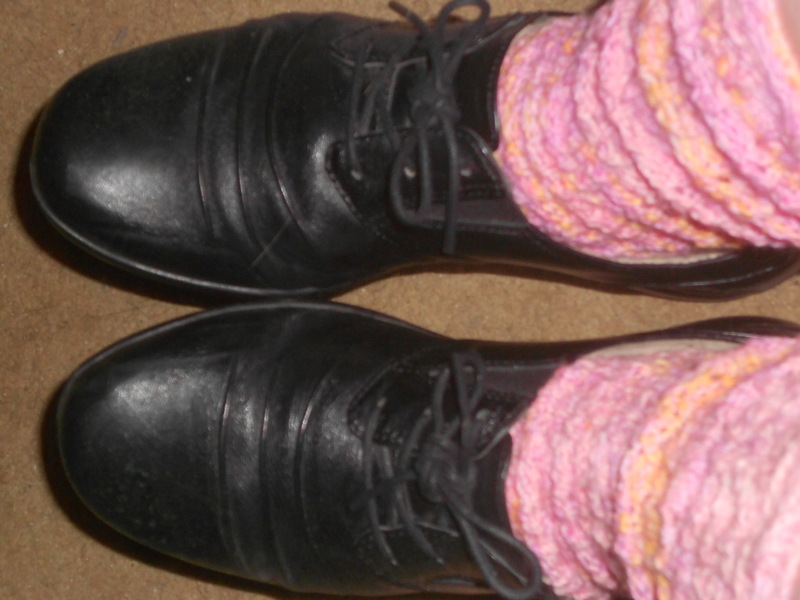 The good news, I had plenty of yarn, and the sock looks okay. 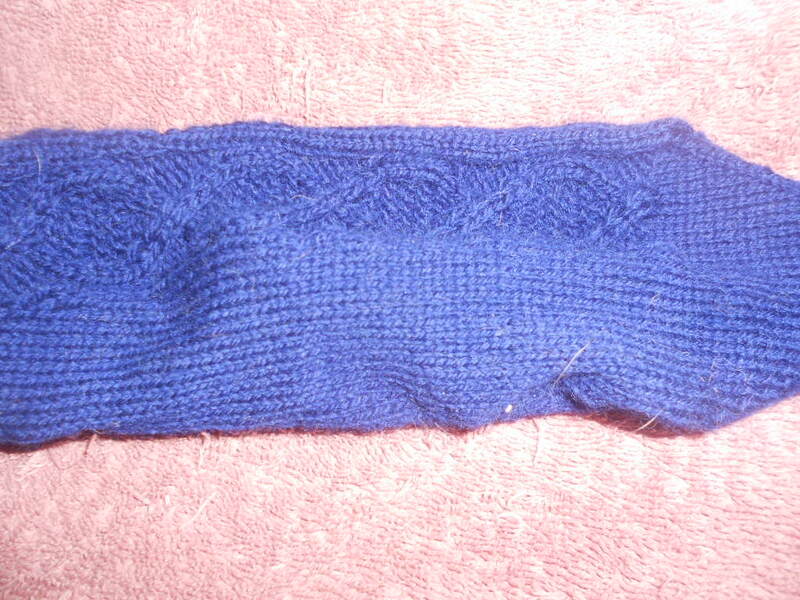 (The bad news is that I have to do the ribbed cuff again). I’ll just have to get that over with Sunday or Monday night. I will admit, I was tempted to try them on. But since they are gifts for someone else, I may have to have the gift recipient try them on and snap a photo to share between during Christmas and New Year’s. Someone, please remind me to take my camera for Christmas events this year. Before I begin, yes it’s pronounced Mackinaw and spelled Mackinac…one must love their French, you have to figure out which half of the word to swallow. I’d rather have the fudge, and there was fudge. 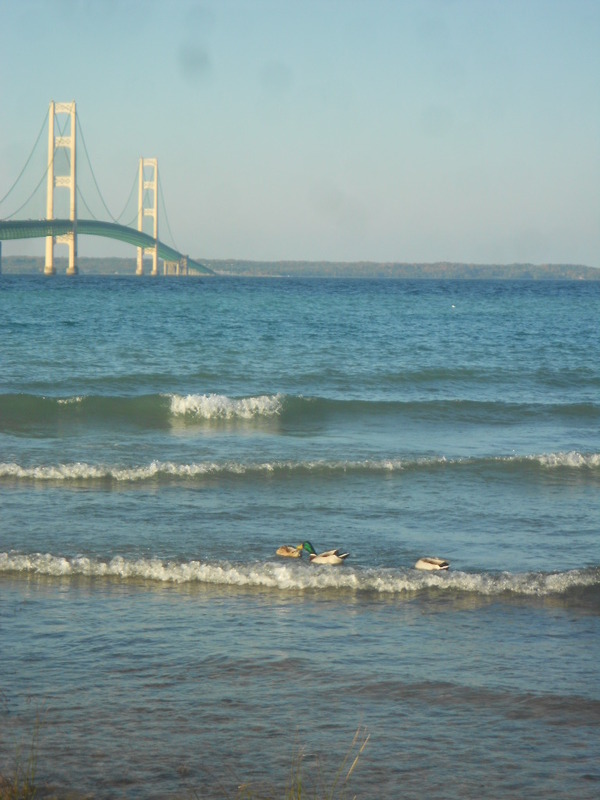 The Bridge as viewed from Mackinac City (south of the bridge). I wish you could have joined us. 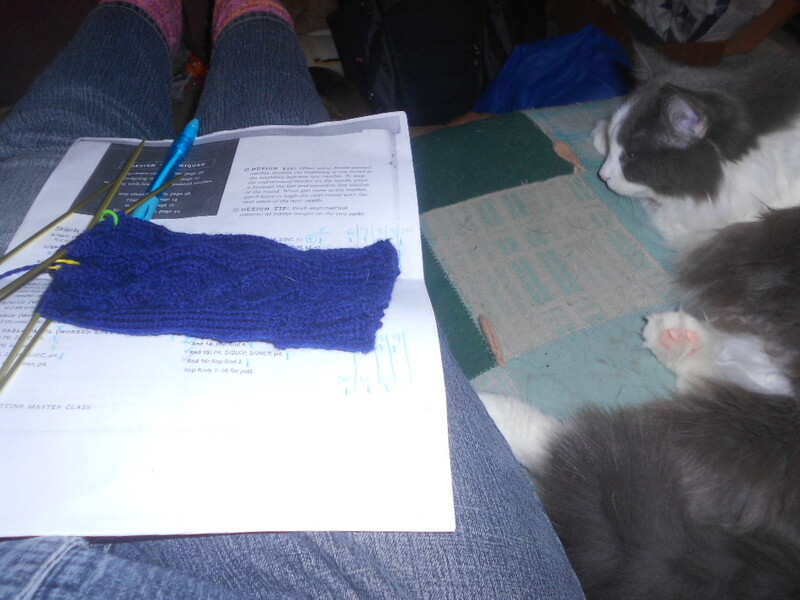 I promise, there was knitting…in fact, there has been more knitting this week than I normally accomplish in a month. I think it’s the pressure of the intention as well as the cabling patterns. The cabling patterns encourage me to keep going. Why? I never thought you’d ask. Because it’s easier to finish on the last round of the section than to figure out just where I was when I left off, especially if I forget to mark a row. I do that often enough. I found myself with some time on my hands this week when I wasn’t driving up to the bridge with my boyfriend, aunt and two dogs. I’ll tell you all about it in a moment, I promise. It does make for an interesting trip. When I got home, tired and exhausted, I think I made some dinner(or whatever meal we were on) and then sat down to knit. I got one more cable section done, and met the traveling rows. 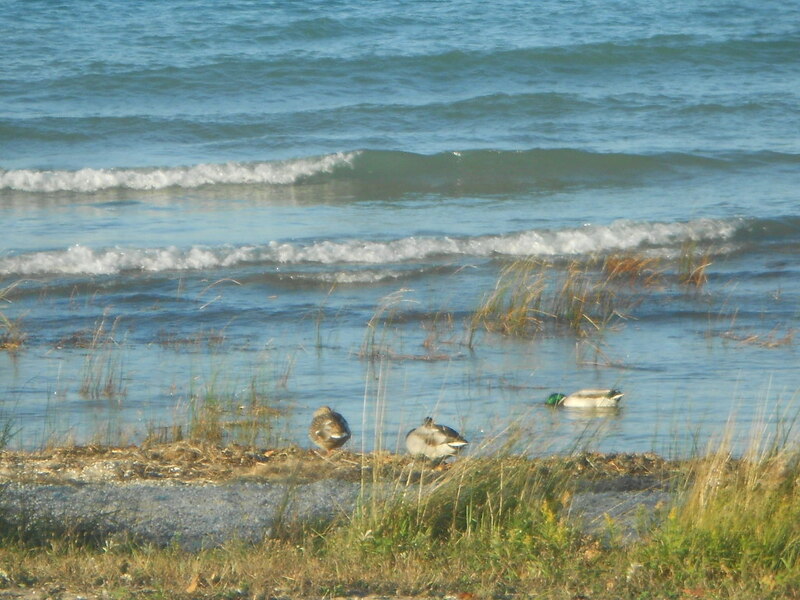 Ducks at Mackinac…on Lake Michigan…see, and James’ took the dogs a short distance away before he let them try to catch one (they didn’t, they’re working dogs, not hunting dogs). I didn’t know you could make cables travel. But I like travel. I even tolerate it well in cabling. This was a surprise. I felt as if there was a lot going on with these socks. 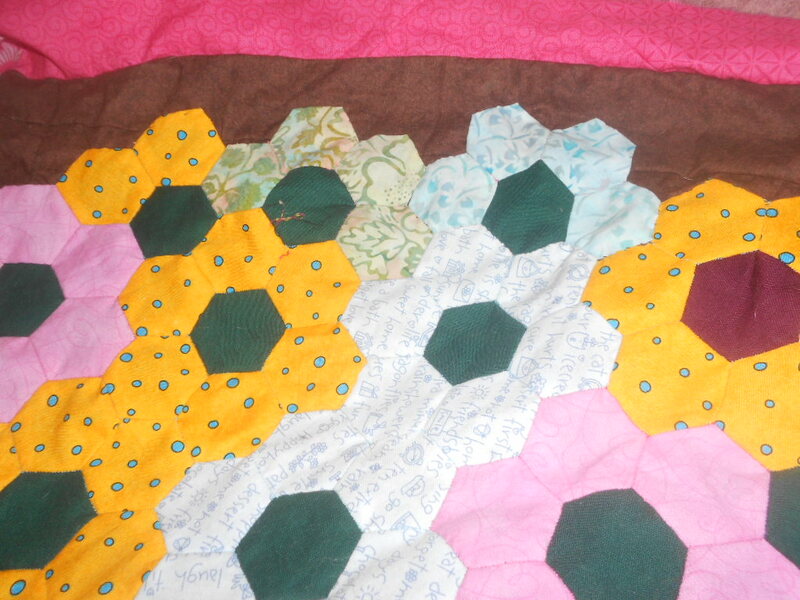 I called this pattern more complicated than a craps game while I was in the midst of it this week. My dear James insisted it wasn’t. He doesn’t know knitting, but he does know craps. And surprisingly, he’s only heard a small amount of swearing from me this week. Most of the time I was able to pay attention to what I was supposed to be doing. Just as you can only travel one mile at a time(we’re talking driving here, not flying), you can only knit one or two stitches at a time. No one has talked me into knitting 3 together yet, but I expect the day will come. There will likely be cussing that day, perhaps I should ease up on the tension first;-)…But we’ll cross that bridge when we come to it. Looks like I’ve completed four sections of cable and traveling, with Maeve’s help. Speaking of bridges, we went to see the bridge of bridges this weekend. We did not cross. 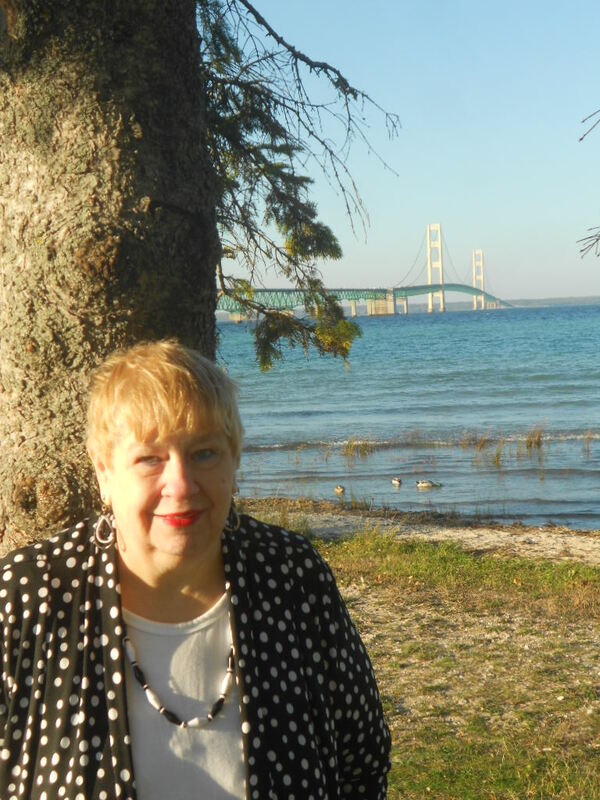 My aunt simply wanted photos of the bridge, and some Mackinac Island Fudge. If you go to Mackniac and do not come back with fudge…well, just turn your car around, and go right back up there and wait for the shop to open. Do not quibble about price, just pick a flavor or three and pay the fee. Trust me, this is tradition. Even Michiganders follow this rule to the letter. I’ve yet to hear of anyone leaving without fudge, nor do I care to. It is a grave sin to leave without the best fudge I’ve ever had. And photos should happen, but those can be photo-shopped or bought on postcards. You weren’t really in Mackinac until you come back with fudge. We have both photos and fudge, and I’m happy to share. In fact, let me find a clean spot of kitchen. 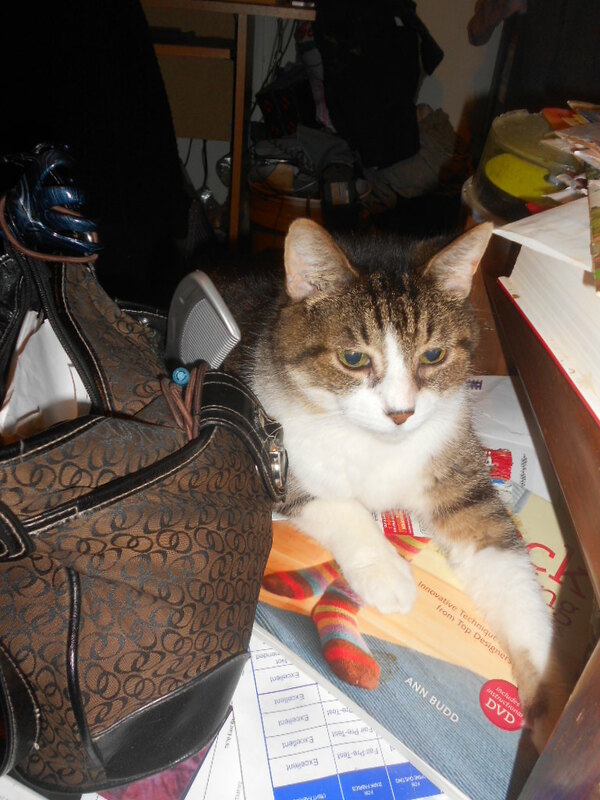 Okay, okay, so we need to clean the kitchen…I found the lap desk. See, there’s fudge…and isn’t it a little slice of heaven. It’s so much a little slice of heaven that it, well…. Actually, I must confess, it brings out the devil in me(just a little bit). 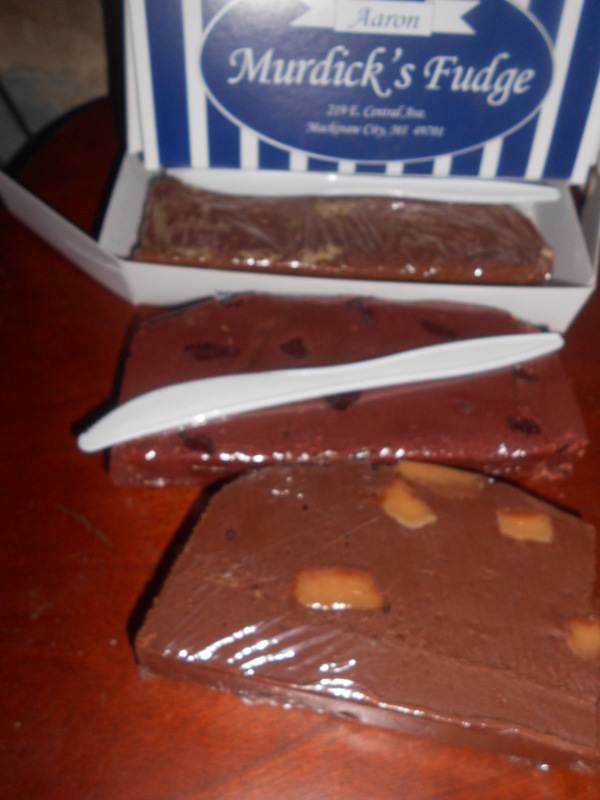 Upon announcing my return and posting photos on facebook Sunday night, my dad promptly demanded requested fudge. He didn’t go, and he’s still pouting that I have run over like the dutiful daughter he hoped I’d become and deliver him a slab of his favorite kind of fudge. And yes, you can buy it online, but you do not get the fresh lake air or the ducks or the bridge in the background…or this time of year– the colors of the trees. It’s an experience, and best shared. Now, back to the knitting. And there was knitting…I managed a cable section each night for three out of four nights. Phew…the third night, I felt sick and I still tried to sew a dress. I had too many deadlines, and may have squeezed too much into this week. But life is meant to be lived, these socks are meant to be cabled and bridges must be visited in order to get more fudge while we have the time to share these adventures. I hope I have time, and I’m certain my seventy-one year old aunt has time, but it wore her out, and I think we might make this some sort of tradition. Did I mention I’m big on tradition? If not, perhaps you know me well enough by now…and if you don’t, I’m sure you’ll soon figure it out. Now, give me one more moment to mention dinner. Dear James asked the young lady at the fudge shop for a dinner recommendation for burgers and beer. They recommended Keyhole Bar & Grill. It made for a good burger in a friendly atmosphere. We had a great trip! 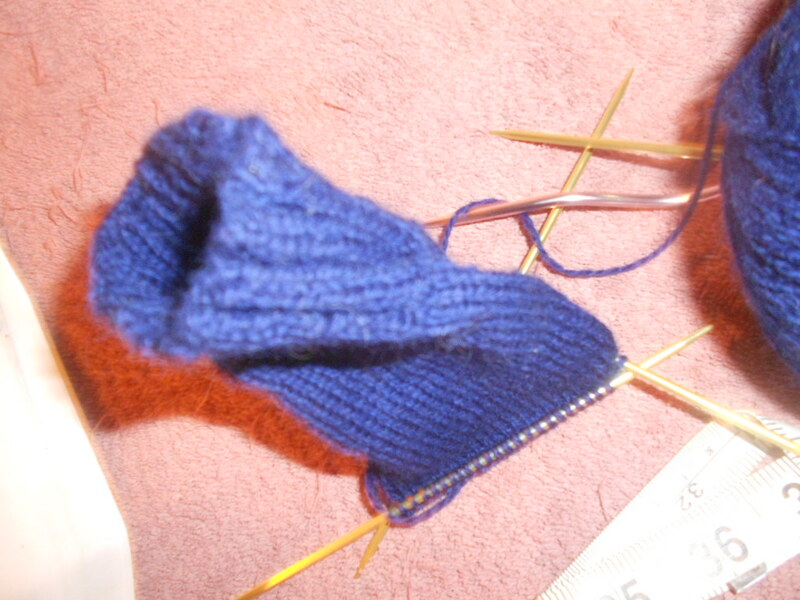 I begin this sock in a knit 2, purl 2 rib. Can you guess why this is my least favorite? I somehow have an easier time tracking four or five stitches, not 2. I do not want to knit all the same stitches, but I don’t want to mix them up every other stitch as well. This goes on for an inch and a half. Then I must address the missing stitch markers, which leads to a find of three bones and more balls and other items we’ve been wondering where they disappeared. We also discovered that the best puppy toy box is the footstool. 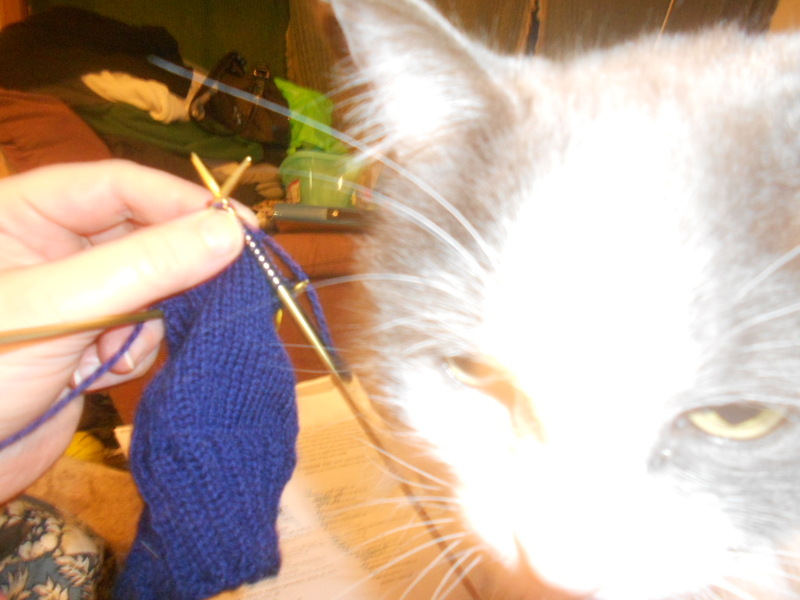 However, there were no stitch markers there. I considered using a rubber band or two from a rubber band bracelet that has broken(my Little, Mariah, gifted me a few of these when she got her loom). I ended up buying some at the local yarn store and picking up some cookie cutter Christmas gifts(it’s still semi-secret, as Christmas is a couple of months away, so no photos at this time). 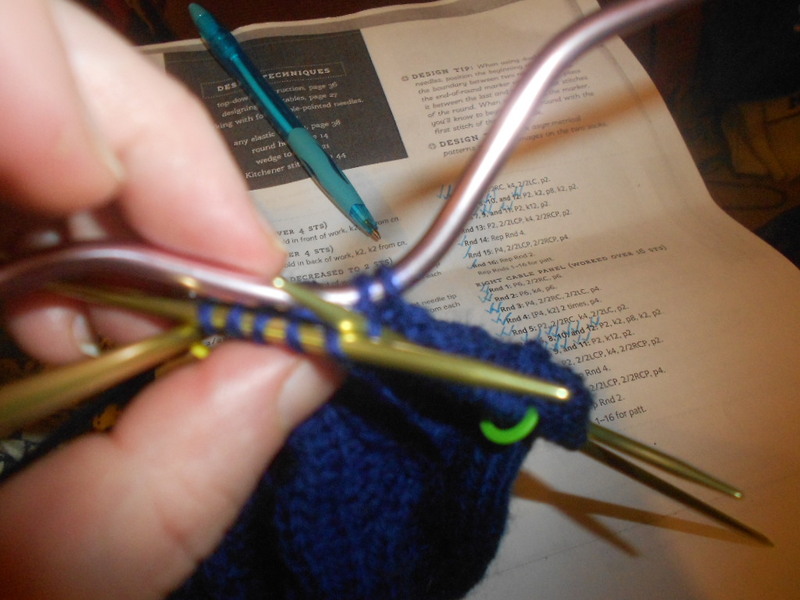 Now that I have the stitch markers, I began reading the directions for the cable stitches. Half of it is still greek to me, even though the stitches are defined in the book. 2/2LC and 2/2RC are described, but I’m never quite certain what is meant by the front of work or back of work…There are You Tube videos that help make this distinction, thankfully. I watched a couple and begin to to work with my cable needle. I even thought I was getting the hang of it for a moment. Cabling in process…Yes, it helps to mark off my work. I was, mostly. Please don’t get me wrong. 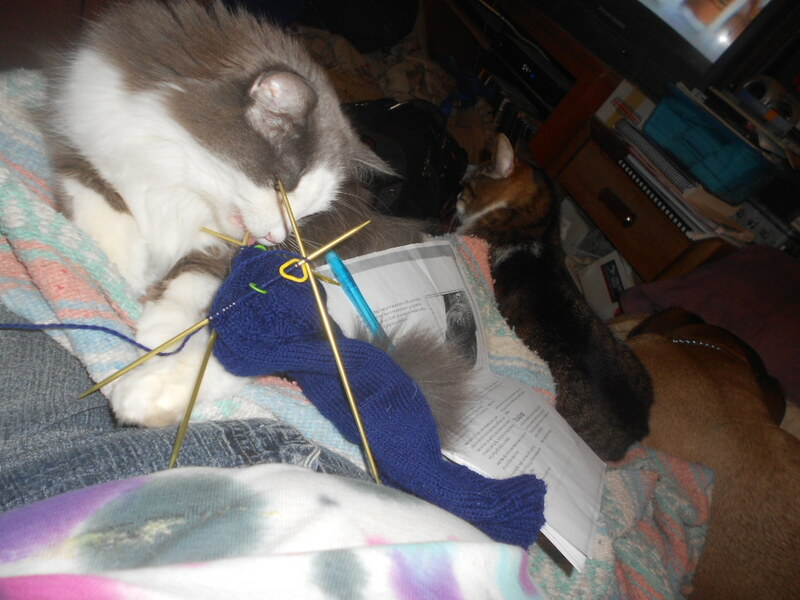 But I did learn from this endeavor(besides locking up the stitch markers and other non-kitten toys). The biggest thing I learned was to take cabling one small stitch or section at a time. I’m also grateful this pattern is worked over sixteen stitches. Any more and I might have lost those marbles. (I’m told I don’t have many more to lose, but I do find people willing to donate their own marbles often, regardless of how much they are using them at the moment.) 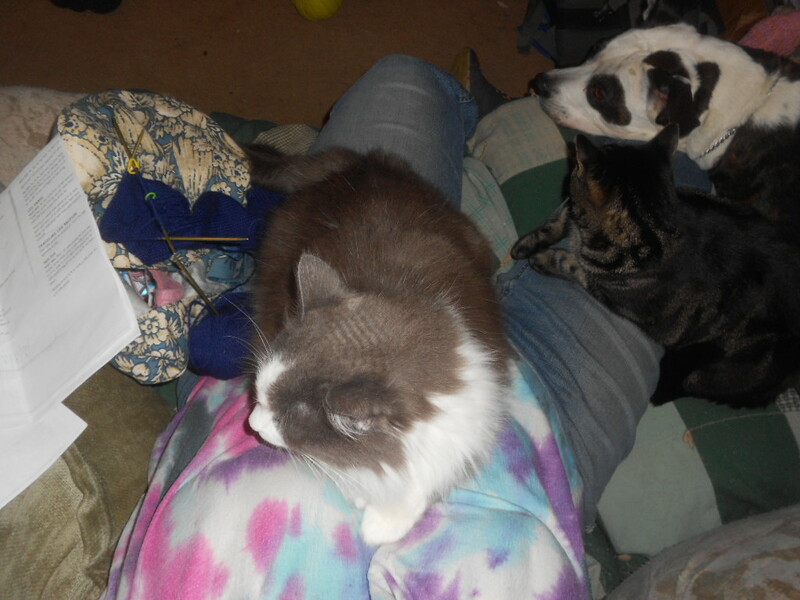 Alas, I’m not knitting marbles or casings for them. If I do, I’ll make sure they’re cute. 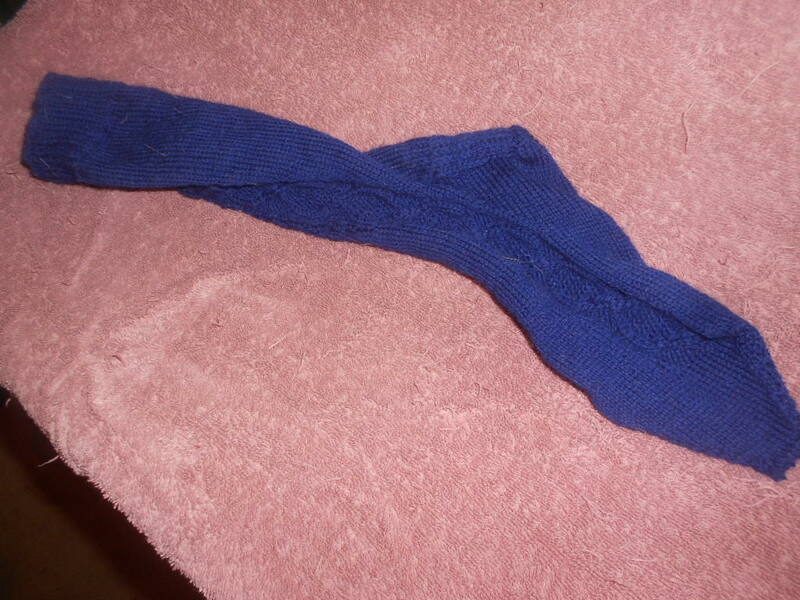 The simple side of the sock. ). Tonight, as I sat down to knit, I realized one of my sections didn’t look as smooth as it should. It’s four or five rows up in the cable. 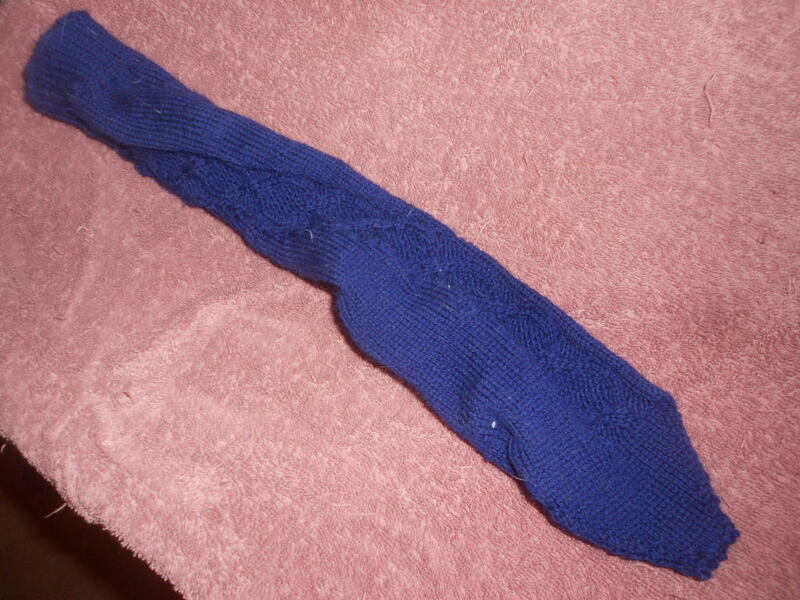 I wondered if I’d crossed it wrong, but I wasn’t going back to fix one or two stitches for an 11 year old’s socks. 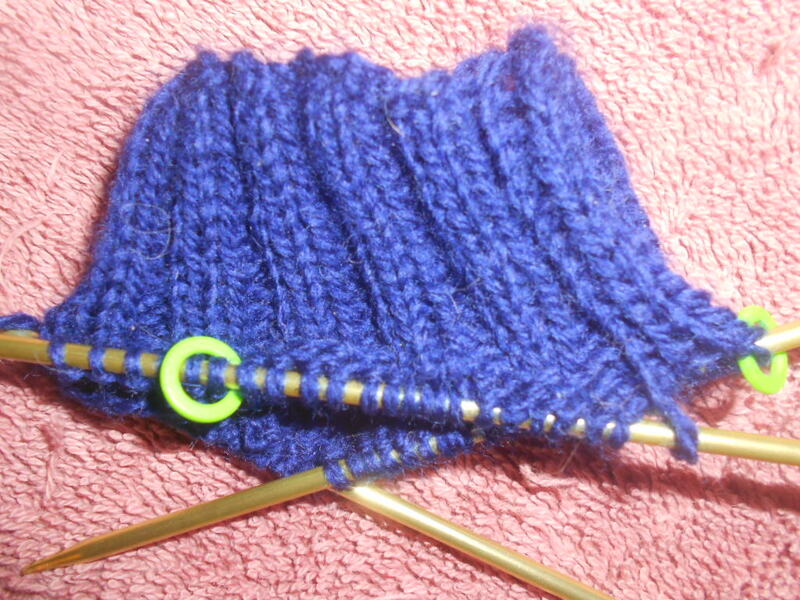 I knit on, cabling as I went. This pattern is coming out well on the solid color socks and I was content. Then I got to the bottom of the second round of the pattern repeat and noticed I’ve only used two of the six defined stitches. Then I looked at the bottom half of my pattern repeat and saw this innocent and sneaky p following my crosses. What? Who knew you could purl during the actual act of cabling? Oy and vey. Now I know I have a mistake, I was on row 13 of 16 on the left side as I discovered this. I made the correction there, I believe. 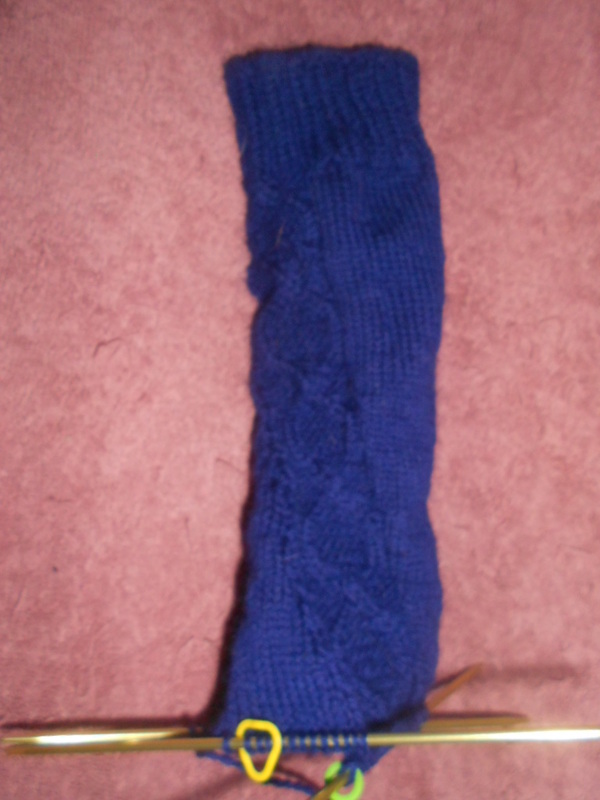 I thought about ripping it out and starting over, but I am only a perfectionist about knitting when I have to be. I don’t think I have to be at this point. It’d look prettier if I did it right, but it’s okay to slip in an angel kiss now and then, and leave it, right? I’m glad she’s 11 and still learning to knit. If I had more time between now and Christmas, (I currently have about ten weeks), I might rip it out, but I do not have time for ripping back that many rows to fix it, since I didn’t realize it until I was done with the second repeat of the pattern. Next week, I get to try this thing called a traveling leg section and have to decide if this is the left or right sock and mark it as well. This could get interesting. Join me on my cable journey ladies and gentlemen. 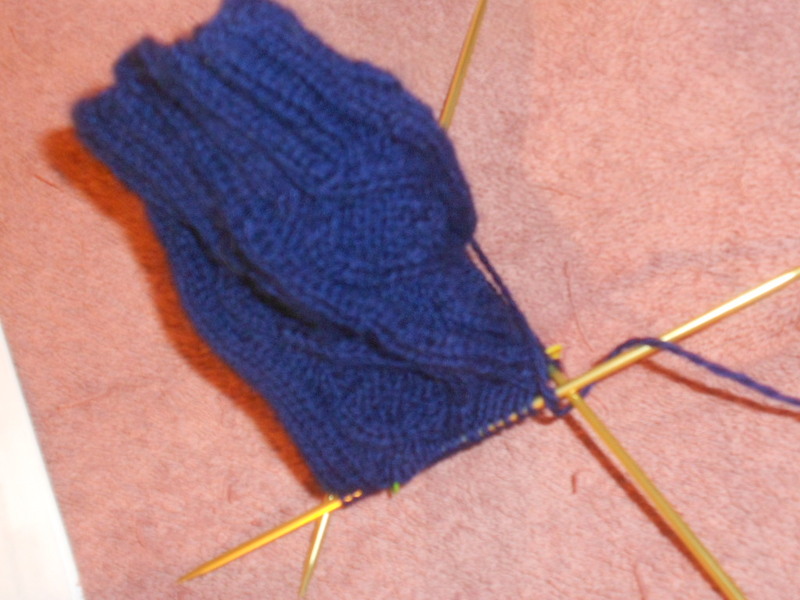 But for now, I just finished knitting the toe. One of my patterns previously called for knitting the star toe, I think it was the Vanilla latte socks from eons ago(these green ones). 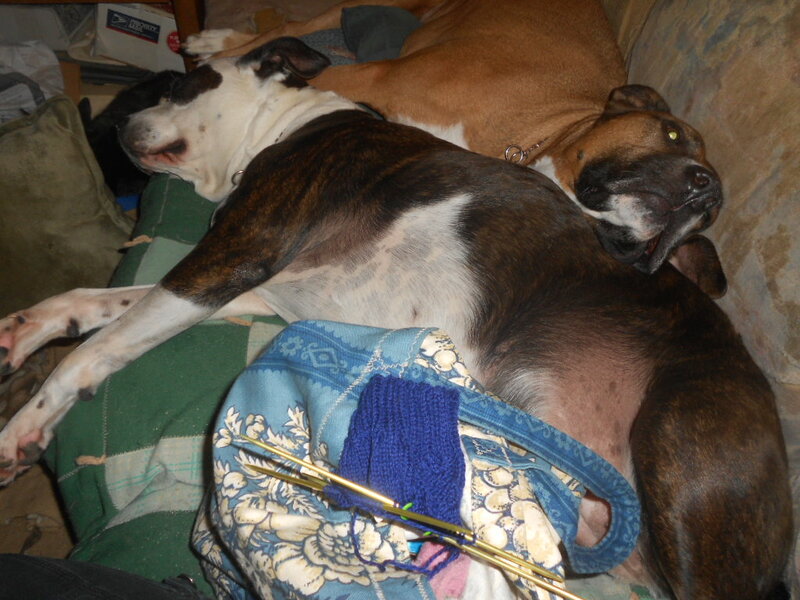 At first, I was slightly impatient with all the knitting involved. 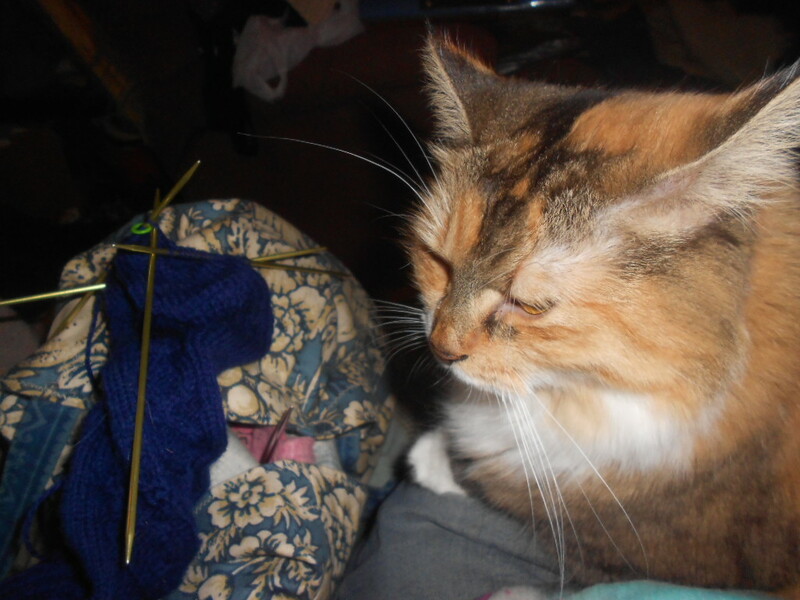 Yes, a knitter can be impatient with the knitting. 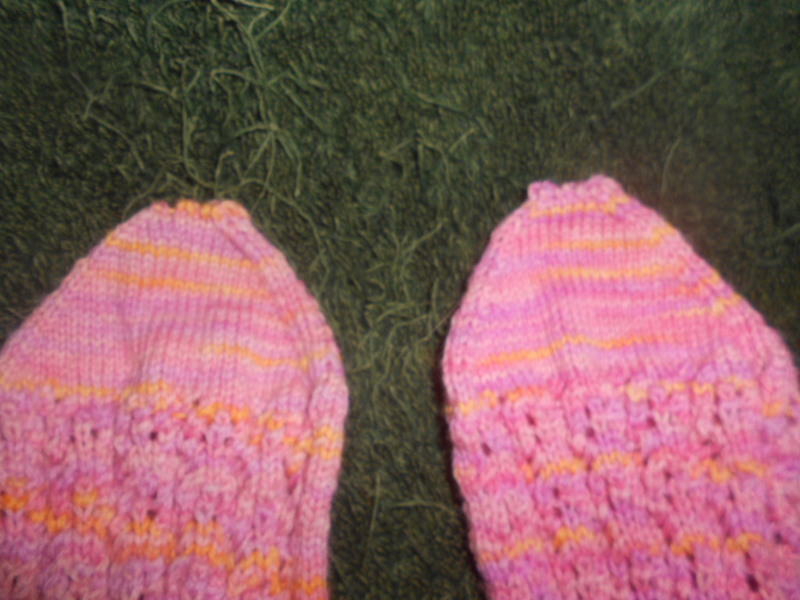 The star toe I’ve used decreases six stitches then knits even for two more rows. 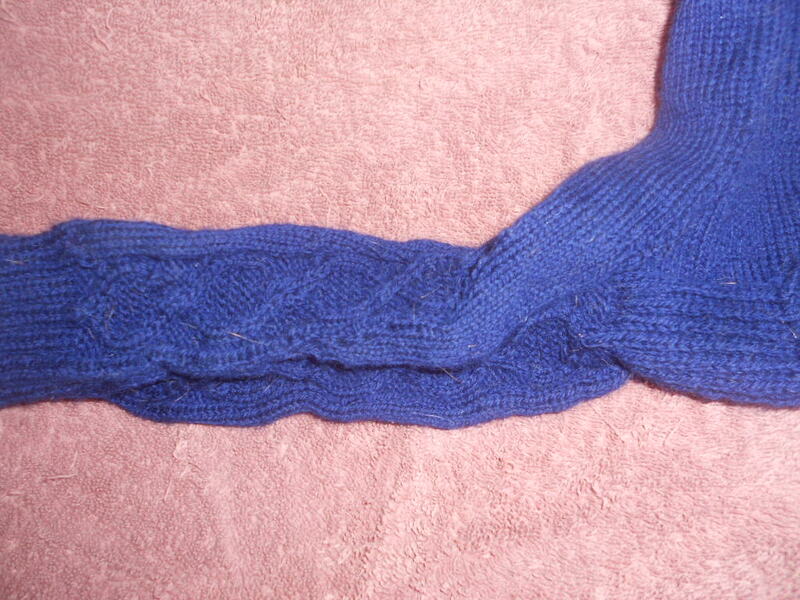 The wedge toe I just knit decreased four stitches in a row, then I knit a row. It feels as if it moves faster. Perhaps it does. However, there is a kitchener stitch involved. I even like and get the kitchener stitch as a method of finishing. Well, I used to like this stitch. I just finished this wedge toe. I’m not sure quite how much time spent is used in the actual star toe at this time. 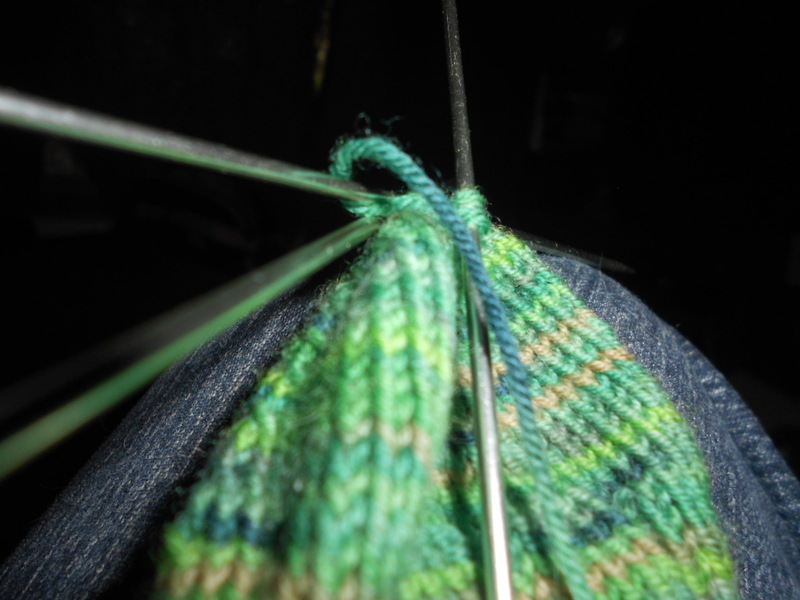 However, as I was knitting, and trying to remember when to slip, slip, knit(ssk) or when to Knit 2 together(k2t), I was wishing to finish using a simple knit six and k2t for the star toe…all the way around. I’m sure there’s some decreasing to get the right multiples at the beginning, but it feels simpler, and once it gets going, it does get going. For the purposes of my future socks, I’ve decided. 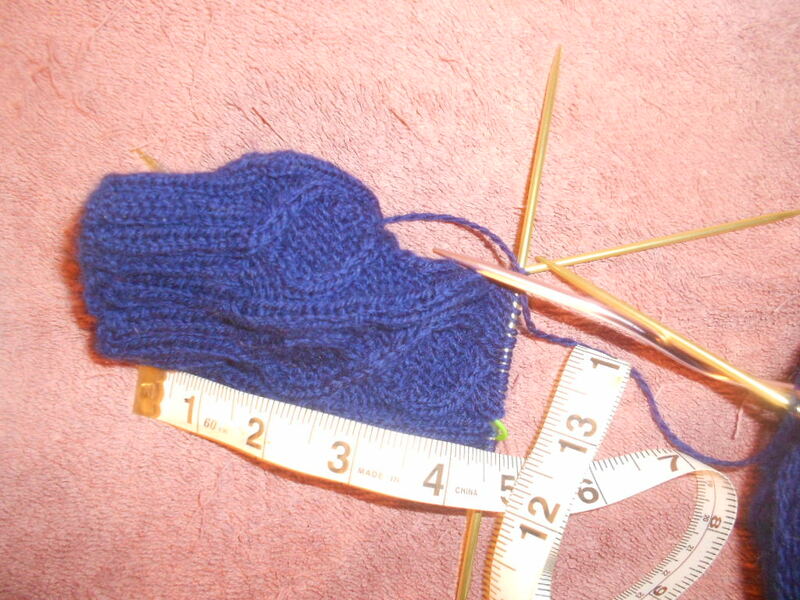 I like the star toe and will use it as often as I may work it into the pattern. 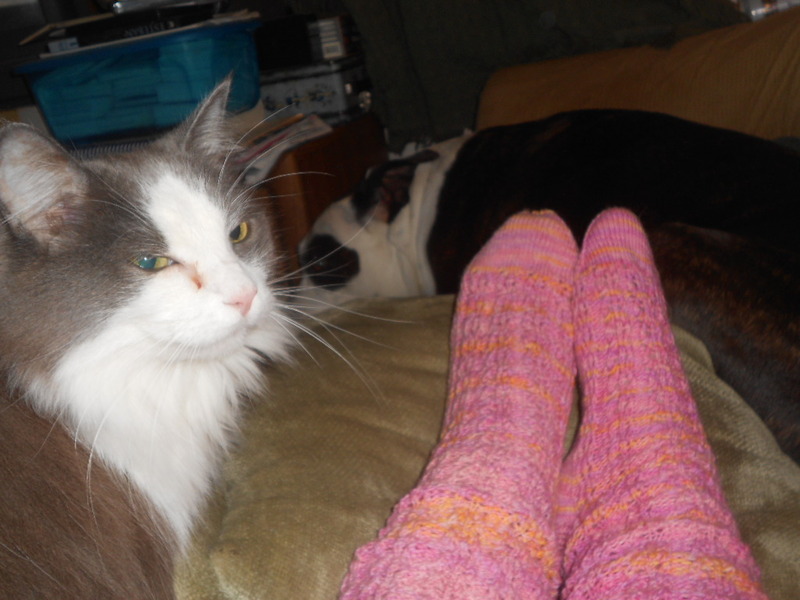 For now, let my feet try on and photograph the socks…where to photograph them…hmm…the kitties and puppies are absolutely curious. Well, some of them were anyhow…which made photos simpler.